Standing tall – 153 feet tall, to be exact – above the S.C. Johnson & Son World Headquarters campus in Racine is the Johnson Wax Research Tower. Designed by Frank Lloyd Wright, it was completed in 1950. The walls are a mix of glass and brick, and at night the glow from inside the tower provides a unique illumination; basically, the building is translucent. Every other floor of the 15 floors total is a mezzanine, set back from exterior walls. The building essentially alternates between smaller circular floors and square floors with filleted edges, since the corners of the structure are curved. The windows are made of Pyrex tubes – 17.5 miles of them. S.C. Johnson used the building as its research headquarters until 1982. A number of products you’ve probably used were developed and tested in this building, including everything from Glade air fresheners to Pledge furniture polish to Off! insect repellent. While most research is conducted in more recently constructed lab space today, the Johnson Wax Research Building continues to be used for office space on several of its floors. The building is open for public tours, generally from March through December. 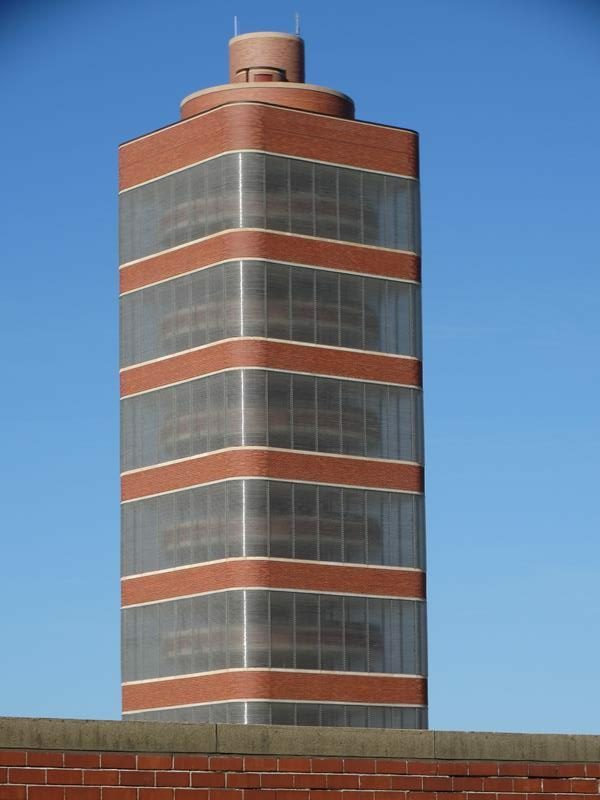 You’ll find the Johnson Wax Research Tower along Highway 32, between the junctions of Highways 11 and 20. Highway 38 begins about one mile to the north on the other side of downtown.